Progress Road MOT Service Centre can supply and fit car brakes to almost any car.For a competitive quote call us on 01702 421411. The rigours of stop/go motoring on today's overcrowded roads can place a lot of stress on brakes. 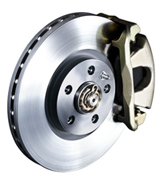 So for maximum safety and peace of mind it makes sense to have your brakes checked regularly. Stop by at Progress Road MOT Service Centre and our fully trained brake specialists will be happy to provide you with a comprehensive brake inspection.